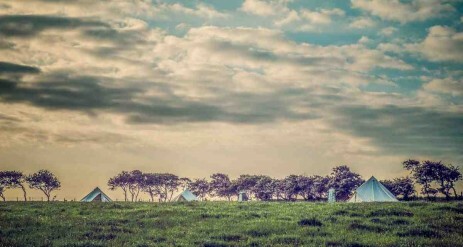 The Bells of Hemscott is a unique opportunity for Glamping in Northumberland and to get away from modern life and wind down in traditional canvas Bell Tents on our working farm. 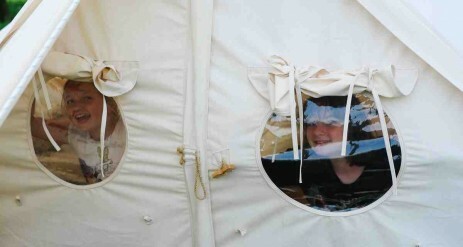 We are a pop-up site and only open in the Summer Holidays. Our Canvas Village is located in a pretty meadow field near the wildlife ponds on the farm. The Village is approximately 10 minutes walk from the farm yard down a farm track (you are welcome to drive down the lane and park outside the camping meadow). 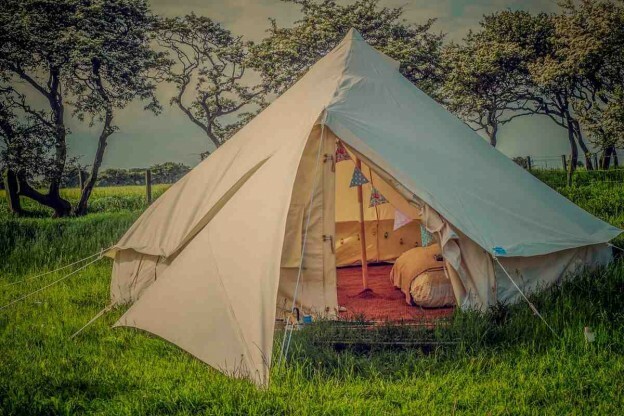 There are Bell Tents and a Shepherd’s Hut for hire in the Canvas Village with basic facilities including composting loos and a kitchen and washing up shed. There are hot showers available at the farm. Please remember when booking that we aren’t offering posh amenities but simple, clean off-grid living. There are no electric hook ups and we unashamedly steer clear of that ‘fancy stuff’ we want to stay as ‘wild’ as possible. We are on a lovely quiet and sandy beach at Druridge Bay that you can easily wander over to and enjoy a barbeque or a dip in the clean water. Go down to the beach early in the morning to watch the sun-rise and see it fall over the tents in the evening. As there is no lighting other than solar we have fantastic skies for stargazing. The beach is a 15 minute walk from the Canvas Village. In the summer we are joined most nights by The Old Dog and Duck mobile horsebox bar. The bar moves around the farm and is open for drinks and often BBQ nights. 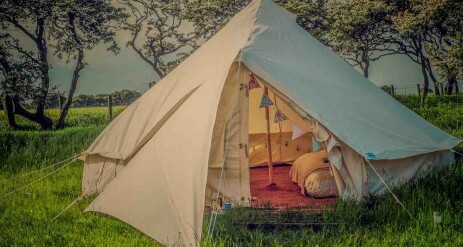 Our five metre Bell Tents in the Canvas Village come fully furnished for you to turn up and unpack.They include a double airbed, a double futon and a child’s chair bed. Bedding is provided for the double bed only. They have crate tables and jam jar tealight lanterns and a kitchen box with plates, mugs, bowls, cutlery, utensils and a pan set. Outside there is a rocket stove to cook on and a fire pit. You will need to bring your camping chairs. Bells sleep 2 adults and up to 3 children included in the price. You can have additional adults (to a max of 4) for an additional £20/person/night. Please note that we are a couples / family friendly site and while we do allow small groups we do expect you to maintain our ‘quiet’ philosophy. The Shepherd’s Hut has a double sofa-bed, and the same bedding and kit outside as the Bells & Whistles. 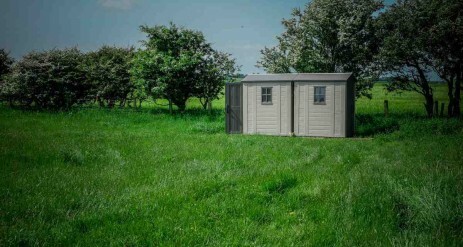 The Shepherd’s Hut is suitable for adults only and sleeps 2. For hardier souls with their own gear we offer Wild(ish) Camping right in the sand dunes, a mere minute from the beach. Please note that the only facilities for Campers are compost loos and washing up areas and access to ths farm showers at certain times. We now offer alpaca walks around the farm, you can choose from 1 or 2 hour walks, or go for a Prosecco Picnic, and lead one of our docile alpacas with you. 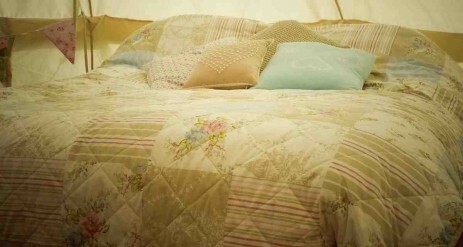 You can have a glamping wedding at Hemscott Hill, please see our website for further information. We work with The Clarty Events Co to bring farm based fun to Hen Weekends. See our website if you are interested in our packages. If camping out isn’t your thing, or you have a large group and prefer a mix of accommodation, we also have a beautiful two bedroom holiday cottage on the farm. Poppy Cottage was fully refurbished in 2013 and has country style decor with rustic features such as exposed wooden beams, sandstone flooring, wood burning stove and hand quilted bed runners. We also have an 18 bed Bunkbarn called Calico Barn that has rooms sleeping 2, 4 and 6. We are based in Northumberland, on the coast just north of Cresswell and near the market towns of Alnwick, Amble and Morpeth. 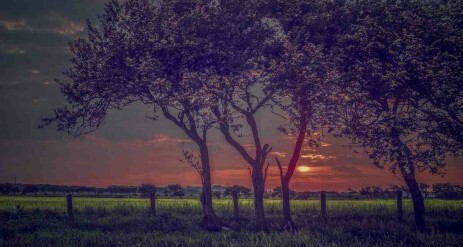 From the camp you can walk to Widdrington Village where there is the friendly Widdrington Inn, serving good local food and a farm shop/cafe called The Country Barn. Walk a mile along the beach for an Ice Cream at Cresswell Ices passing the Drift Cafe on the way. Or walk across the fields and come out near the village of Ellington, with the Plough Inn, also serving good food. From Widdrington you can catch a bus right up the Northumbrian Coast as far as Berwick upon Tweed, or south down to Newcastle upon Tyne, taking in our local market towns. Sorry we cannot accept dogs in the glamping area. There is a dog friendly part of the camping area but please book in advance.